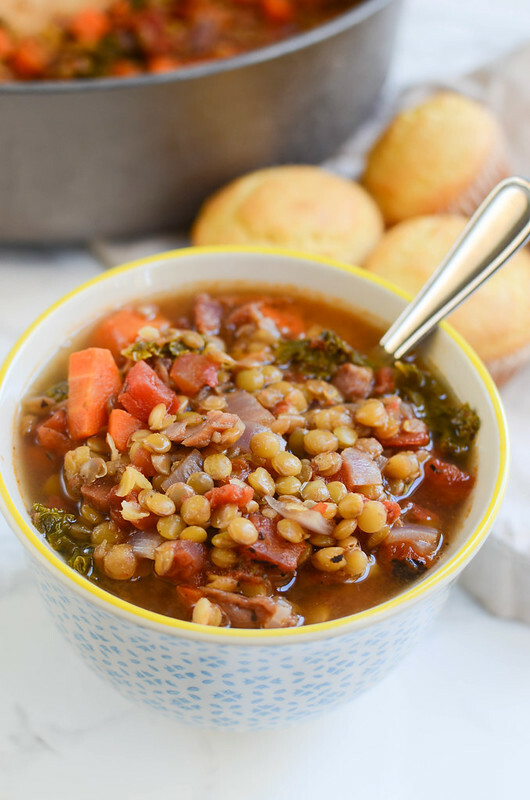 Ham and Lentil Soup is the perfect way to use leftover ham! Ham, lentils, and loaded with veggies. 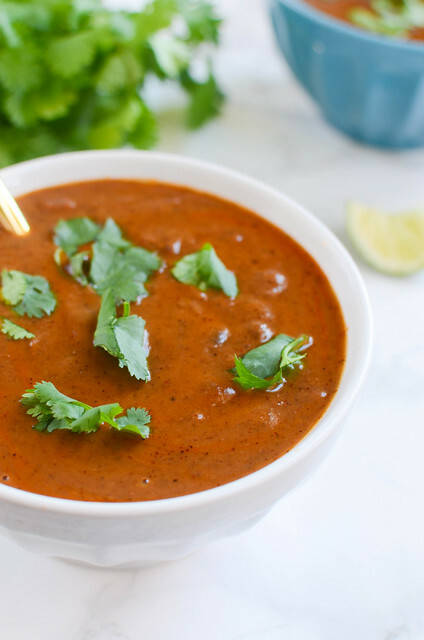 It’s quick, inexpensive, and delicious! Are we sure it’s really the last day of November? Anyway, I’m putting my Christmas tree up today because if I don’t do it now, tomorrow I’ll start the “Well, it’s too late now! Christmas is practically here!” thing and we just won’t have a Christmas tree this year. Okay, let’s talk Christmas dinner. Do you do ham? We do ham and then we buy a ton of those yummy Hawaiian rolls and make sandwiches. Honestly, my favorite part of Christmas. I have ham sandwiches for breakfast, lunch, and diner for daaaaaaaays. My favorite ham for these sandwiches is the Smithfield Spiral Sliced Smoked Ham. Like, Christmas wouldn’t be complete with it. They’re fully cooked, hickory-smoked, and they are available in a variety of different glaze flavors. You guys, you must try the Salted Caramel glaze! They also have Pecan Praline, Brown Sugar, and a signature glaze. If we get tired of sandwiches, I always make a big batch of soup with whatever ham we have left. 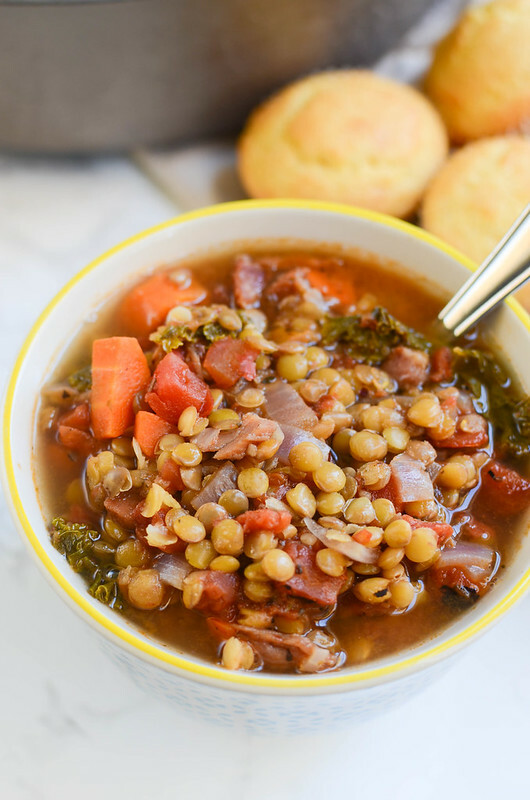 This Ham and Lentil Soup is perfect for that because I almost always have all the ingredients on hand and it comes together in no time. Plus, my kids – who are pretty weird about things about obvious veggies – will eat it. Kale and all! 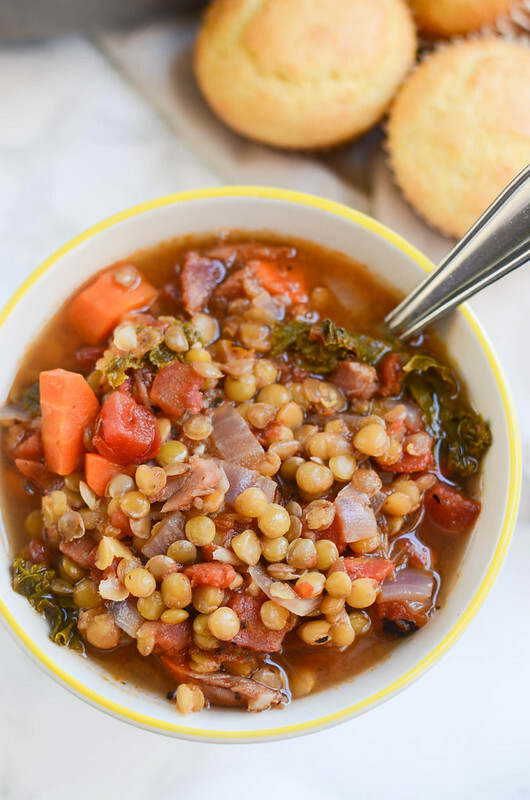 So yeah, it’s got the ham and the lentils but it also has kale, fire-roasted diced tomatoes, carrots, and onions. You could throw in some celery but I’m not into that so I leave it out. Simmer it all together with some chicken broth until the lentils are tender and it’s good to go. I serve it with corn muffins and it’s perfection. 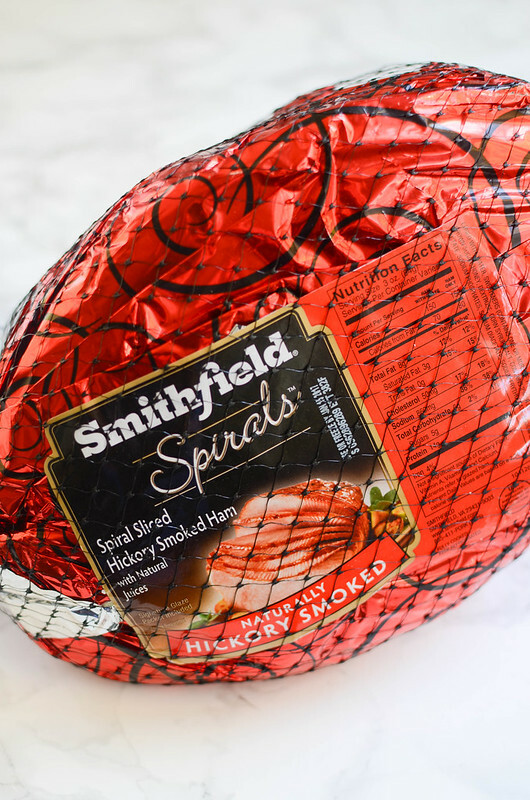 If you’re wanting to try a Smithfield Spiral Sliced Ham for the holidays this year, they are available at grocery stores nationwide. For more information on Smithfield, check out Smithfield Spiral Sliced Smoked Ham or their Facebook page. Heat oil over medium-high heat in a large soup pot. Add onion and carrots and cook until softened, about 5 minutes. Add garlic and ham and cook, stirring, for another 30 seconds, until the garlic is fragrant. Add lentils, diced tomatoes, Italian seasoning, salt and pepper, bay leaves, and chicken broth. Cover and simmer for 45 minutes. Stir in chopped kale; simmer for another 15 minutes. Discard bay leaves before serving. 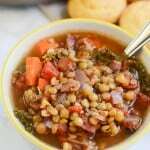 5 Responses to "Ham and Lentil Soup"
Are the lentils dry or canned? I have a small package, but I didn’t know what to do with them until now. 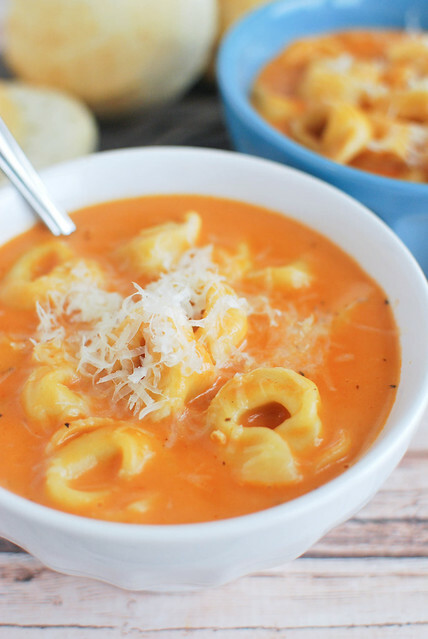 This soup looks really good! Sounds pretty carb friendly….any idea right off hand?? Thanx! I made this last night and it was fantastic!!!!! I did put celery in, and was not able to locate those tomatoes. I used stewed Italian style tomatoes. 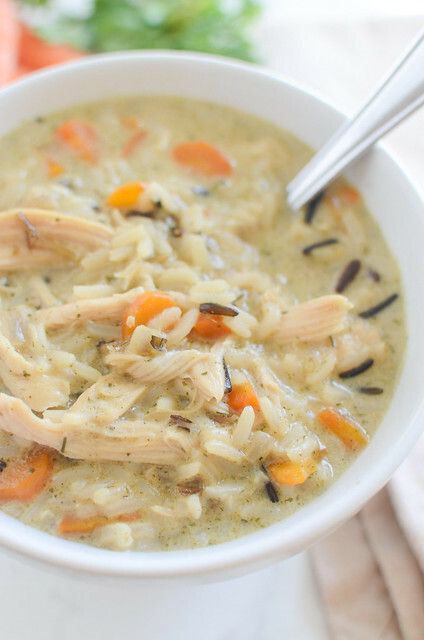 I would recommend this recipe and have shared it several times! Great job! Yay! I’m so glad you enjoyed it! I need to make it again soon.